Aprenda os segredos do metrô de Nova York em uma excursão subterrânea de 2,5 horas com um guia particular. Ouça histórias sobre engenharia, tecnologia e pessoas por trás da construção do metrô. Descubra lendas e segredos sobre níveis abandonados, estações escondidas e casas falsas que disfarçam rotas de fuga pela cidade. 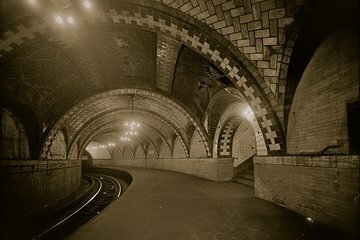 Veja arte oficial e não-oficial ao seguir a linha de 1904 de Bowling Green até o Grand Central Terminal, e dê uma olhada surpreendente em lugares que todo nova-iorquino vê - mas poucos notam. Our guide Gary was terrific - so knowledgeable and passionate about the history of the NYC underground! It was so interesting. We could have spent another 1/2 day learning more! Gary is the MTA's greatest ambassador, he loves the subject and it really comes through in his presentation. He brings you through the history of the formation of the subway and how it all came together to create what we have today. We really enjoyed this tour and highly recommend it!! Grear tour guy! Gary was very informative and an awesome guide. Great tour to learn about the trains and how it all got started. Fabulous tour guide. Deeply knowledgeable about the subways and NYC history. Engaging manner. Tailored tour to our group. We had lots of fun and learned a lot. Book this tour!!!! We expected to be doing a lot of walking in the old subways only to find out that it is illegal. There was a lot of time sitting on a bench while the guide very knowledgable went over pictures on his computer. Would have been better walking and looking, that's why we booked the trip. Still had a relatively good time despite not being what we signed up for. Great tour! Gary took time to answer our questions and provide history and background. I would highly recommend this tour for rail fans, history buffs, and those interested in getting some background about the system that moves the city. Gary is spectacular!!! Highly recommend for tourists and New Yorkers alike! If you are into train and or NYC history this is a wonderful tour. Very interesting tour and knowledgeable as well. A lot of information and very cool tour.